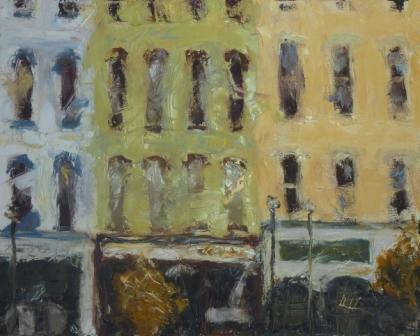 For those of you that like the new abstract cityscapes, then check out the host of new ones I recently finished. For those of you who prefer the more contemporary realism cityscapes, don’t fret, I have not permanently changed my style. I merely created a series to decorate my living room (nice benefit of being an oil painter). Ionia Abstract is the only new painting for sale. 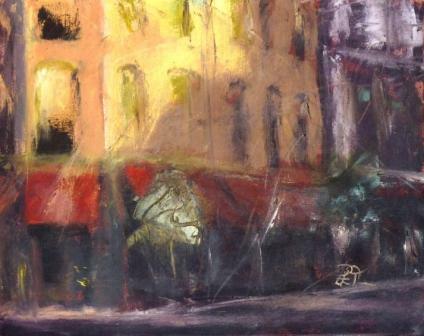 You can find it either at the Cityscape gallery or the Flora & Abstract gallery. The rest are for my wife and our house. I added the pics of some of them (see above and below). Let me know what you think? Oil paint with 7 colors…yes you heard me right! The title of this post says that I paint with 7 colors (plus white). Actually I paint about 90% of my pictures using only 3 colors. 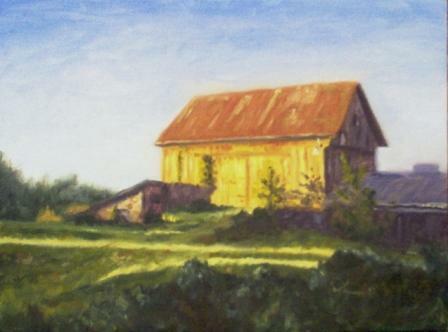 Take a look at the painting, “Leonard Street Barn.” This was the f irst painting I ever did with just the 3 colors. As you can see, there is a wide variety of color, both in the lights and in the shadows. It took me only 1 hour to complete this painting on a 9″ by 12″ canvas board. Try counting the colors you see. I did this in a class taught by Jim Connelly. That was when I learned how to truly understand color and when I first began to have actual control over it. Let me explain. Prior to limiting my palette of colors, I had a whole heaping basket of oil paints. I had several reds, yellows, blues, and of course the whole gamut of earth tones like Yellow Ochre and Burnt Sienna. It was so confusing to know which colors to grab, and it seemed like the more I used, the more I got confused and my colors failed to blend together well visually on the canvas. Color can be overwhelming. But all you need is the ability to make black to be able to create the majority of your colors. How do you do that, you might ask? Alizarin Crimson, Ultramarine Blue, and Indian Yellow (or something similar). I can make a perfectly balanced black with mixing just those 3 colors. Add white and you have a gray scale. Take away a touch of the blue and you have something more brown. Remember brown is really a dark orange, so without the blue you are left with more red and yellow (red and yellow make orange). Simple as that. Take away a little of the red and you are in deep dark green territory. And of course, less yellow means you are in the purple area. Add some of that white and you get your colors. Forget buying Burnt Umber. Make it. In fact, a little Ultramarine Blue added to a Burnt Sienna makes the Burnt Umber. As you can see, you have control now, while automatically allowing for some harmony. Think about it…if you are only using 3 colors, your painting will retain harmony no matter how crazy you get! Now you might see the holes you have to fill with that palette. What you truly need is a warm and a cool of your blue, yellow, and red. So I have a Cerulean Blue to go with my Ultramarine. That is especially needed for skies near the horizon. Mix the two and you have a Cobalt Blue, so forget buying that one again. I have a cool yellow with a Lemon Yellow and a warmer red with a Cadmium Red. What is the 7th color? I have a Viridian Green because that is just so unique and rich of a color (you simply can’t make it). Add the Ultramarine Blue to it and you have a gr eat many more deep blues. A touch of Alizarin Crimson with them and you have crazy purples. This 7th color is only for very specific colors and I use it rarely. 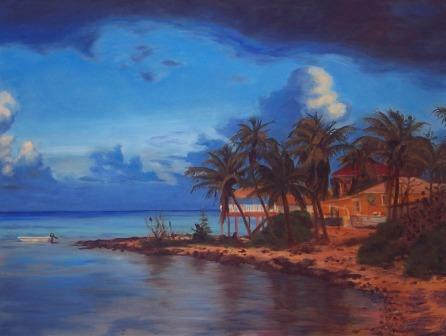 The main use is for the aqua colors of the Caribbean. Truly, I paint 90% of my paintings with just the 3 main colors. I suggest you do what I did in the beginning. Put a swatch of paint from all your various tubes on a piece of paper and label them. Then create all the colors you can from your limited palette. Make all the greens, from dark to light with the addition of white, etc. You will soon see that you found your Sap Green right there at one point. That means you do not have to buy another tube of that. I did that with about 30 tubes of paint. I found each one on my color chart made from my 7 colors. I no longer needed to buy anything but my 7. Did I mention I am cheap? So not only did it make it easier for me to find the right color, but it saved me money! To me, that is worth the effort right there. And along the way, you will find that you gain more and more control over you colors, and therefore your paintings. Why oil paint? Why not acrylic, watercolor, alkyds, casein, gouache, colored pencil, egg tempera, or pastels? It is hard to explain, but there is just something about oils that make that medium the king of all mediums. 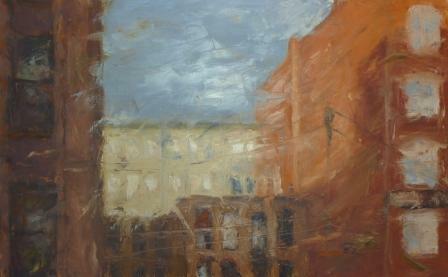 It is not that oils are necessarily the oldest and most reliable way to make a picture. In fact, it is quite possible to paint with oils in a way to jeopardize the longevity of the picture. I guess before I go on about what makes oils so special, I will have to bore many readers with a little art history. Although I have read hundreds of books on art, I was never an art student and I would be careful quoting my little art history lesson to anybody who possesses any real knowledge on the subject. Well most of us know that people have made pictures since the ice ages and that the earliest societies such as Ancient Egypt had great artists, but art the way we know it was more prominent in the last thousand years. One of the earlier mediums was egg tempera, which – you guessed it – uses egg yolk. “Temperas” are binder agents that support the pigments (actual colors). Egg tempera was first popular in the middle ages in Southern Europe and it dries very rapidly like your morning omelet does on your frying pan (which is a pain to clean off if you don’t soak it immediately). Egg tempera basically has to be applied in thin layers, so the colors tend to not be as rich as with other mediums. Many artists make their own paint – and yes – they use eggs. Another “dairy” paint is casein, which is derived from milk. Ancient Egyptians painted with casein, which dries with a nice even consistency. That made casein very valuable for painting murals. Gouache, which was first popular in 12th century Islamic art, on the other hand, is not a muralist’s best friend. Gouache is like watercolor in that it is pigment supported in water, but there is a white chalk added that makes gouache paints heavier and opaque. They dry differently than other mediums because the dark colors dry and become lighter while the lighter colors dry and become darker. Now take out the white chalk and you have watercolor…essentially. Watercolors are generally used on papaer instead of canvas, which would explain why watercolors became so popular in Europe in the 1400’s after paper became readily available. One of the differences with watercolor compared to the other mediums is that artists paint light to dark, meaning they first paint in the light colors, then darker colors as they progress through the painting, leaving the white of the paper for the lightest lights. Other mediums that are more typically done on paper are pastels and colored pencils. I never would have thought that artists could make fine art with colored pencils, but I have since seen some of the most beaitful rich pictures done in colored pencils. There are many techniques to build up the colors to a rich, dark, smooth finish. Heck, 2010’s Art Prize winner was in pencil! If that sounds like it takes too long, pastels are a good alternative, although more of a messy one. I picture my elementary school days with pastels all over my clothes by the time I finished my project. Pastels were first mentioned by Leonardo De Vinci in 1495 and became very popular for 18th century portraits. Today there are many different types of pastels such as hard pastels, soft pastels, oil pastels, and water-soluable pastels. The newest kid on the block is acrylic paint, which was first commercially available in the 1950’s. Anybody that has painted a room in their house knows how fast acrylics dry. Pull off the dried paint around the rim of the can and you can easily tell the “plastic” feel of dry acyrlic paint. They are not natural. I don’t mean that because they are weird, I say that because they are actually synthetic. Another fast drying medium are alkyds, which are just fast drying oil paints. One of the main differences between oils and alkyds is that alkyd paint dries with evaporation while oil paints dry by oxidation. Oils were used in England as early as the 13th century, but not really applied for artisic purposes until the 15th century. Oils dry very slowly, which allows the artist to blend the wet paint hours or even days after the previous layer was applied. As mentioned above, oils can hold a great deal of pigment, which is why oil paintings can be richer in color than some of the other mediums. This ability to capture color is why I switched to oils myself, but other mediums can be used to create just as brillant colors. Other mediums have the history that oils have, if not more. 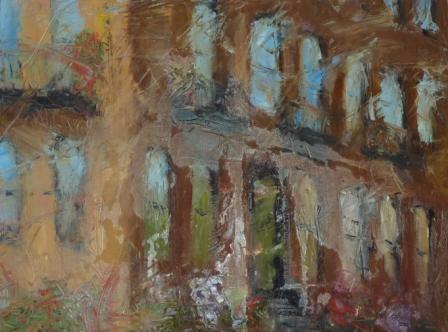 Other mediums show off interesting brush strokes and others can create beautiful soft blended areas just like oils. So why is there this aura about these smelly, buttery paints? I believe that when most of us think of exceptional art, we think of the Great Masters of the Renaissance Period in Europe, and they mostly painted in oil paint. Maybe that is why many of us associate oils as the medium used for the greatest paintings of all time? So why do I paint with oils? Maybe I just like the feel, the consistency, the slow drying time, the smell of turpentine in the evening, the ability to paint thin or thick, or maybe the ability to create any color out of only 7 colors and white. Or maybe it is just because I want to be assocaited with the Great Masters. Hey, I need all the help I can get!